This is a very difficult "Forest Training Isle". This Isle will stay in the Extra isle forever. So there is no rush in finishing this at all!! Take your own time to beat this. With more and more character releases the Forest Isles become easier. However this is not something to undermine about the forest. It is still super hard and a challenge to all. You will need all your power for this and a lot of time investment in ships, special levels and sockets. Last stage will have a debuff protector!!! These Stages are so super easy. Stall and get your specials ready! 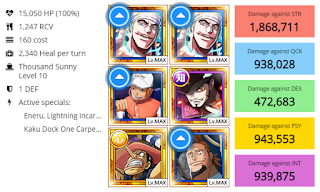 Use Usopp here so you don't get that much damage. Try to heal up with [Meat] orbs from now on.. when you can. Reduce the chain with your socket ability and this one should be no problem. Reduce damage with a special if needed. Try to burst him in 3 turns. If not use another DEF special. Recommened to defeat Fossa first and don't let them go below 50% HP. 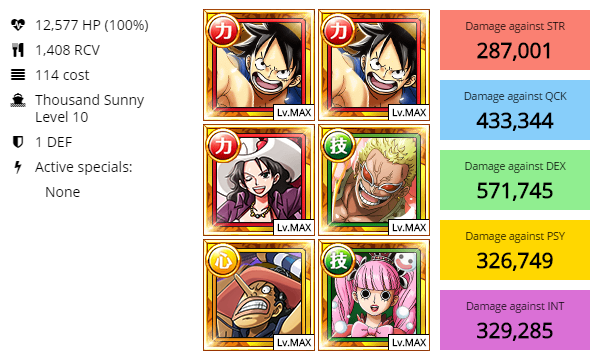 Use Mihawk cut here if needed. Wipe out all pirates in a turn then Izo on next turn. Delays first and DEFs are a must have to be ready here. Either use HP cuts and DEFs here or just break their defense with Perona. Burst him down in 2 turn if possible. Use a DEF special and next turn all in to defeat. Turn delaying as they don't have a protector. Defeat as many as you can. Starting with Ace, Izo and Rakuyo. Use perona special to tank Blamenco's attack. Kill Vista before he attacks another turn.. Keep hitting Blamenco. If you have a SWS zoro use his special before he attacks again.. Stall for more turns Use GP special as soon as its charged and stall even more. Kill before he attacks again. 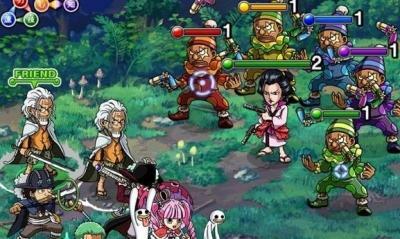 Wb reduces hp by 70% first turn and debuffs for 8 turns Kill both marco and jozu in 3 turns. Use Perona Special to tank WB’s next attack Use GP special before WB’s next attack (the debuff should have run out). 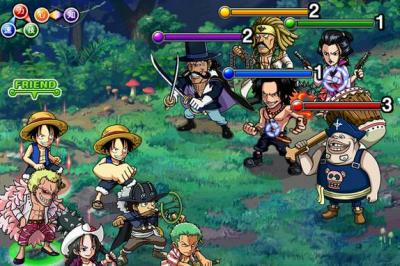 Most of the presented crews will consist of GP Usopp, Alvida, Perona. Those are the best free to play characters for Forest Challenges. Easy to special up, max the level and socket. Mihawk therefore has the ability to cut 30% HP of all enemies and Doffy boosts orb effects by 2x. This crew is possible because of an INT Hawk friend to deal enough damage. Most people will have 4 full sockets on him to help out but only 2 are essential. 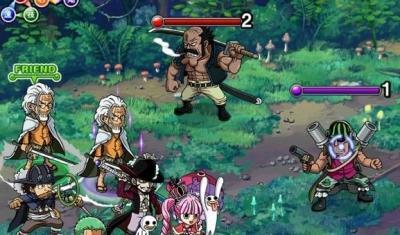 Double Rayleigh with the immense RCV stats can easily recover a lot of HP really fast and are hence able to tank light attacks by most of the bosses from stage 11 to stage 20 in the forest. An alternative to Streaming Wolf Zoro would be Alvida to reduce damage taken by 80%. Probably the easiest way to clear WB Forest. You will heal so much you don't even need a damage reducer. Thatch will provide most QCK orbs and Kaku + Enel specials will enhance those. 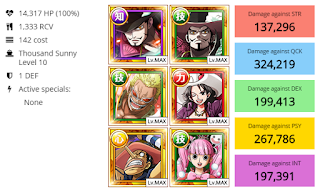 Mihawk has the "nuke", which can help out on Stages 17+. He can be replaced by Sengoku. And for gods sake. You will love the Lv. 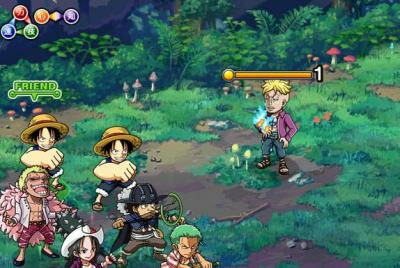 5 Autoheal on God Enel. Very solid Heal and DEF crew when their skillbooks are released. Using the socket abilities will grant stability on this forest. 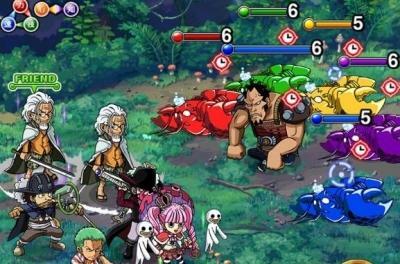 Sabos provide a powerful ATK boost for several turns and Jora can be replaced with Perona. 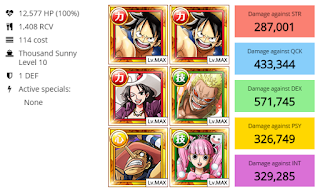 Where Log Luffy doesnt have as much RCV as rayleigh teams, he more than makes up for that loss in the damage output and a self orb manipulation with huge damage outputs because of his special as well. 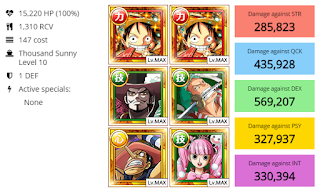 That being said, Log Luffy is the easiest way to clear this forest with the teams that global has. So those lucky enough to have Log Luffy can clear this island. Those without any of the above legends can try a Gear3 team. The same subs work for a Whitebeard crew as well. 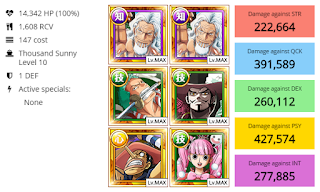 Although the RCV of a double Gear 3 team is not as high as RCV given by the legends, with some meat orbs and just a 20% orb luck the island should be clearable. 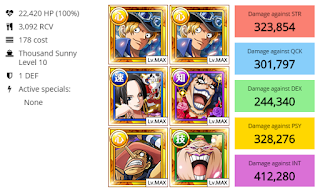 This is because Doflamingo manipulates orbs to give 2 units on an average matching orbs and a huge boost to orbs. There are 2 variations of this team. 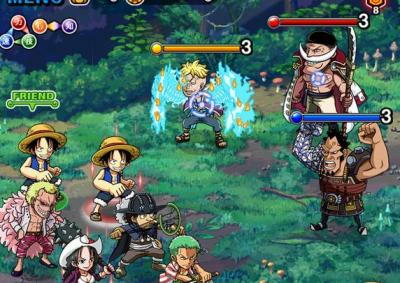 You can use SWS Zoro instead of perona to beat the isle as well but the guide will have a more F2P approach to the team and so will be guided as per perona.